Contextual workspaces enable you to present ticket tools and features based on specific workflows. For example, your company might have a specific workflow to use when a customer makes a return, or when they have a billing issue. This article describes how to create a contextual workspace and define the conditions that will launch the workspace. For information on how to manage contextual workspaces, see Managing contextual workspaces. Workspaces optimize your support workflow, without restricting the tools agents need to complete their jobs. 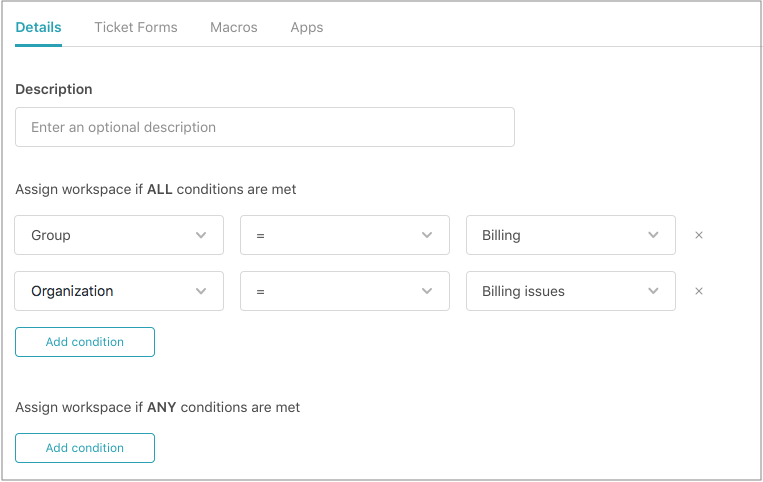 With workspaces, you can simplify the forms and macros that agents see when they first open a ticket, and you can expand, collapse, or reorder apps. The set of workspaces you define can be as simple or as detailed as you need. For example, you could have a single workspace that defines the ticket form and tools your Customer Support team uses, or you could define a full set of workspaces for your Fulfillment Center based different types of international shipping locations, product types, and currencies. Workspaces are for recommendations, not restrictions. Agents can still search for other macros, apply other forms, or use other apps if desired. You create new contextual workspaces, and edit existing ones, from the workspaces page. You can create up to 20 active workspaces for an account and include up to 10 conditions per workspace. Click the Add Workspace button. A new workspace builder opens. The builder includes four tabs: Details, Ticket Forms, Macros, and Apps. On the Details tab, Enter a Title and Description for the workspace, then enter the conditions that will launch the workspace. For more information, see Setting workspace conditions. On the Ticket Forms tab, use the Active form drop-down to select a predefined ticket form to associate with the workspace. You can begin typing the name of the form to filter the displayed list, or you can scroll through the list to locate the form you need. When you select a form, a read-only list of ticket fields appears. If you do not want to apply a ticket form, select No change from the menu. On the Macros tab, select one or more macros to associate with the workspace. To select macros, you can begin typing the name of the macro to locate potential matches, filter the list by Categories or Permissions, or you can scroll through the list to locate the macro you need. Only shared macros are available when creating a workspace. If your macros are sorted into categories, you can click the category name to drill down the list. The macros you select appear in the Selected tab. On the Apps tab, select one or more apps to expand in the Apps panel. Only apps in the ticket sidebar can be set in contextual workspaces. You can begin typing the name of the app to filter the displayed list, or you can scroll through the list to locate the app you need. To change the order that apps appear in tickets, click and hold the drag handles to reorder the apps. 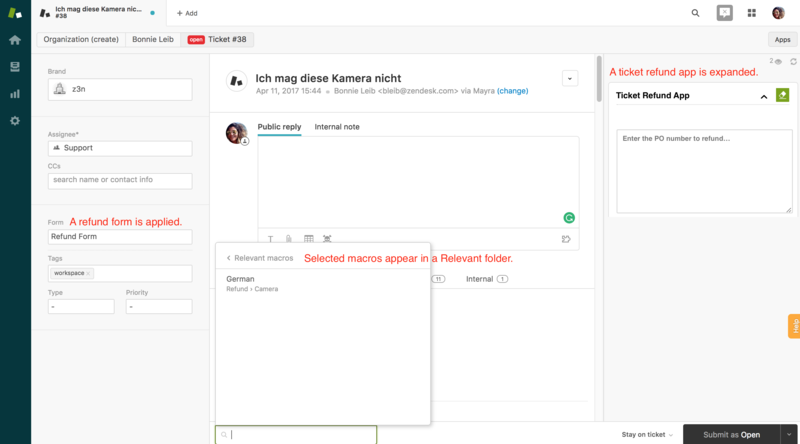 The apps you select to Expand by default will be expanded for all tickets viewed in the workspace. See Announcing expanding and collapsing sidebar apps for more information. 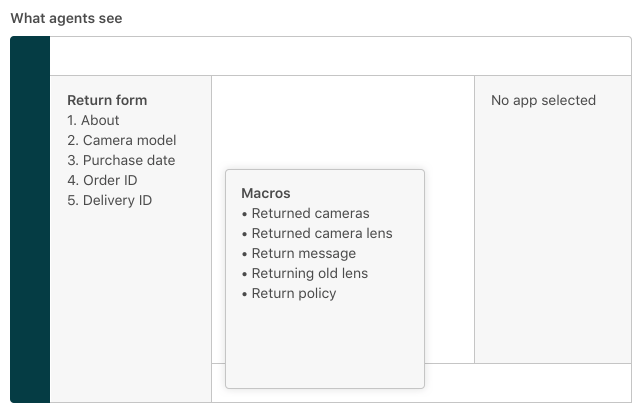 As you define the workspace, the Details tab shows a summary of what the agent will see when they first open the ticket, including form fields, available macros, and apps. Click Save. You are returned to the Workspace edit page, and the new workspace is added to the list. On the Details tab, you can set the conditions that launch the workspace. Each workspace can include up to 10 conditions. For instance, in the example below, any incoming ticket using the Billing Issues form and routed to the Billing group will launch the workspace. Note: Workspace conditions are very similar to Trigger conditions, but with a subset of choices. To see a list of supported conditions, open the drop-down menu. On the Details tab, click the Add condition button under the Assign workspace if ALL conditions are met and/or Assign workspace is ANY conditions are met. If you add conditions under Assign workspace if ALL conditions are met, all of the conditions must be true for the workspace to apply. If you add conditions under Assign workspace is ANY conditions are met, one or more of the conditions must be true for the workspace to apply. Select a condition from the Conditions drop-down list. A field operator determines the relationship between your condition and its value. For example, if you select the field operator Is, your condition must be equal to the value. Different conditions contain different field operators. Select a value. Each condition contains a unique value. Continue to add as many ANY and ALL conditions as needed to create the correct logic for the workspace. Zendesk recommends keeping your conditions simple so they are easier to troubleshoot and maintain. If you include conflicting conditions, an error message appears. I've tried creating a workspace to test out this functionality based around a ticket containing a specific tag, however the options I've selected don't seem to be having an effect on the actual workspace (e.g. users still see all the apps or macros regardless). I've triple checked and the tag is definitely correct on the ticket I'm expecting to see the behaviour for, any ideas? Edit - Am I also wrong in thinking I should be able to pick which apps appear, and not just if they are expanded/collapsed? Contextual workspaces won't override any existing apps permissions. If the app wouldn't otherwise appear for that agent/group/etc. without a workspace, the workspace won't force it to. Our apps are setup to appear for all agents currently, but the settings in contextual workspace do nothing to limit the apps that are visible. Or am I understanding the functionality incorrectly? Nope, it should be limiting apps in that situation. Could you send me an email at czoppa@zendesk.com with a ticket you expect to have the workspace applied and your permission to assume into your account to debug this? Upon more careful reading, I see that I initially misunderstood your question. Workspaces don't control which apps appear, just whether they're expanded or collapsed. Sorry for the confusion! How does it work with priorities? I set up a workspace based on ticket status < Solved so it applies to everyone, closing some apps. Then another workspace based on a group condition, that keeps all the apps collapsed except one that is expanded by default, but no matter what order I set for the workspaces that app stays closed, like if the main workspace overrides everything all the time. Sorry Nicola-- reach out to me at czoppa@zendesk.com. Even though organizations show up as a condition to filter... no box shows up after you select the is/is not dropdown. I tried Safari, Chrome and Firefox. Can anyone else filter by organization? Hey Michael-- I'm not able to reproduce this. Could you reach out to me at czoppa@zendesk.com with your subdomain and turn on CCUA if you don't mind? I'll have someone on my team investigate. This does not seem to be working at all. I am testing this out using simple criteria and nothing is working. Every app is still expanded, they are not in the order I specified in the settings, I can still see every macro... Not sure what is going on. Do contextual workspaces not work on Admin accounts or something? Hey Travis-- Could you reach out to me at czoppa@zendesk.com with your subdomain and turn on CCUA if you don't mind? If you're not the contact on your account, have them give a nod as well. I'll have someone on my team investigate right away. Is there an article actually showing me examples of what it could look like, not just how to set it up? Hi Heather. We don't have a separate article, but we have included a ticket example at the end of this article. See "The agent experience" section. Does this new functionality allow you to create dynamic field display like the Conditional Fields App does? Hey Bill, this is not built into this feature. CFA will be deprecated in 2019 and will be replaced with native conditional ticket fields; Open Beta targeted for Q1 2019! How do you sign up to be a beta tester? Eligible customers - those whose plan allows them to use CFA - will see an in-app sign up on their Ticket Forms page. Two questions: 1) Will there be a process in place to migrate CFA into the new system? 2) Is there a plan to have contextual workspaces apply to tickets created by my agents as they are creating them? As of right now, if an agent starts creating a new ticket, it pulls in the basic ticket and they have to choose which form to apply. It would be great if the system pulled in the right ticket form based on the agent's group. "Will there be a process in place to migrate CFA into the new system?" @amoore "Is there a plan to have contextual workspaces apply to tickets created by my agents as they are creating them?" Right now you can only vary workspaces by ticket details, not agent details. We don't plan to change this in the near term, but this is valuable feedback-- thank you for it! Just testing but I'm not sure I understand the purpose. The workspace functionality would only be useful if it didn't display the apps at all. Having them appear minimised serves no purpose. For me anyway. The apps are minimized in a given workspace, rather than hidden, so that agents aren't overwhelmed with apps that they don't specifically need on the ticket they're looking at, but the apps are still easily available in case they end up being needed later. One thing I would love to see is the ticket form change on-the-fly once the requester is entered on the default ticket form(the form would change based on the org) we have 4 departments using our instance all with different ticket forms. It changes on first save. By then the agent has already changed the form to enter the information specific to their support group. I just tried to have selected macros based on the language used by the ticket's sender, but it doesn't seem to work. I don't see "relevant macros" on the macro list. We would like to personalize the expanded apps displayed and later on the macros available. This currently does not happen as all apps are expanded or collapsed as per the way I've set them up when opening a previous ticket. If I collapse all apps now, the next ticket I would open would have the same display, not the one according to the Contextual Workspaces set up. I also experience that with macros, I still see all macros associated to my groups despite selecting macros to display in case a condition is met. We are multi-brand and this seems to work on an inbound ticket (already under a given brand) - the agents only see the macros (and ticket form applied to the workspace) - Yay!! But when they are creating an outbound ticket and choosing the brand, I had hoped Zendesk would use Contextual Workspaces to limit the form AND macros. Maybe I'm doing something wrong? I've been checking out this feature and it seems that the Tags condition doesn't currently work. Any idea when tags as a condition will work? When trying to add a condition for tags you just get a regular text box instead of the field you would get for adding tag conditions for things like triggers.